So i tried like a hundred of times, and i keep getting this error when trying to import the wp_options table in phpmyadmin for my WP multisite. I am importing a database that was created on EE v3 and trying to import on a EE v4 setup. I would ignore this but this makes it impossible to add new posts in my WP admin. How do i fix this, how do i force the table to import? 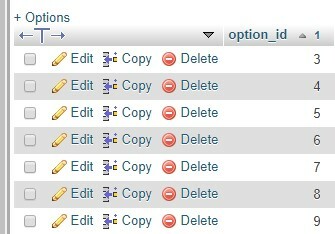 I am not sure if this is the issue, but option_id in my wp_options tables start from number 3 and not number 1.